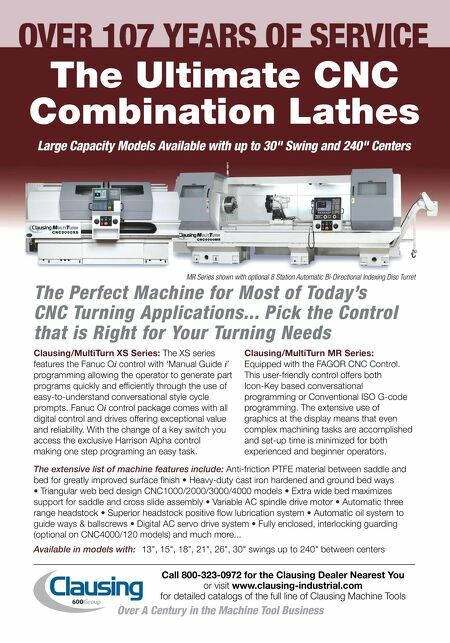 MMS MAY 2018 72 mmsonline.com WORKHOLDING This freedom enhances lights-out operations, especially in an automated machining cell with a pallet pool. Here are more details about the powercell. It provides as many as eight hours of opera- tion before it needs to be exchanged for a fully charged powercell. Handles on the top and side of the cell can be grasped for its removal. Exchanging the powercells can be accomplished in a few seconds, depending on how the user arranges the exchange station. The depleted pow- ercell can be replenished in about 35 minutes on a recharging station plugged into a 120-volt AC outlet. With the latest lithium-ion technology, the powercell is expected to experience 2,000 charges before its capacity falls below 80 percent of its original potential, Mr. Mel says. 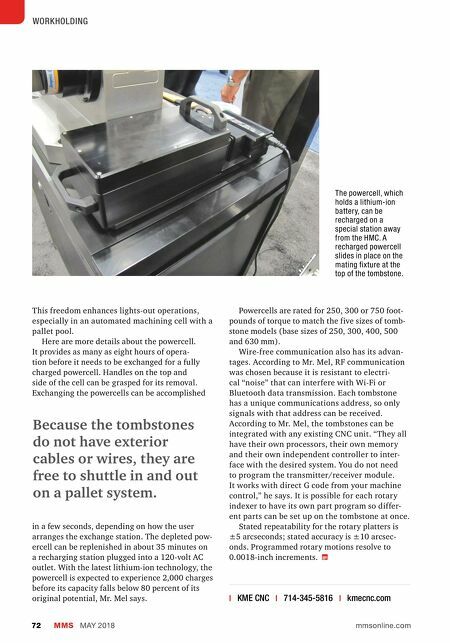 Because the tombstones do not have exterior cables or wires, they are free to shuttle in and out on a pallet system. Powercells are rated for 250, 300 or 750 foot- pounds of torque to match the five sizes of tomb- stone models (base sizes of 250, 300, 400, 500 and 630 mm). Wire-free communication also has its advan- tages. According to Mr. Mel, RF communication was chosen because it is resistant to electri- cal "noise" that can interfere with Wi-Fi or Bluetooth data transmission. Each tombstone has a unique communications address, so only signals with that address can be received. According to Mr. Mel, the tombstones can be integrated with any existing CNC unit. "They all have their own processors, their own memory and their own independent controller to inter- face with the desired system. You do not need to program the transmitter/receiver module. It works with direct G code from your machine control," he says. It is possible for each rotary indexer to have its own part program so differ- ent parts can be set up on the tombstone at once. Stated repeatability for the rotary platters is ±5 arcseconds; stated accuracy is ±10 arcsec- onds. Programmed rotary motions resolve to 0.0018-inch increments. | KME CNC | 714-345-5816 | kmecnc.com The powercell, which holds a lithium-ion battery, can be recharged on a special station away from the HMC. A recharged powercell slides in place on the mating fixture at the top of the tombstone.